To hell with Valentine’s Day. The girls are taking their love lives into their own hands, humming Sisters Are Doing It For Themselves in a militant anthem. I received an email from Cal, one of my best girlfriends in Singapore. It’s the first time he’s invited me to a sports event, which I thought was definite cause for a post. It’s time! It’s time - to make a wish for romance in the coming year! How nice is your fruit? (Pretty damn nice, thank you very much!) How far can you throw into the Singapore River?Choose carefully - throw it far! I read this with mixed feelings. I’m not that eager to get hitched but my spirit of sportswomanship was stirred. An event to lob oranges at men! Count me in! What fun! Was this what Adam and Eve and the Garden of Eden was all about? Did Eve get bopped on the head by an apple instead? Did she then knock out one of Adam's ribs with an orange? Visions of me clad in a pitcher’s outfit by the riverside with a basket of Mandarin oranges flitted through my mind. I started a mental checklist of what I would need for this sports day. Strong pitching arm. I stared at my skinny arm. No worries, I will practise this whole week at home. A coal miner’s hard hat. You know … the ones with that big ole spot light in the middle of the hat. It’s 9pm people! I’m gonna need some light to spot my target and stun them before they can make a break for it. The hard hat would also be a good idea in case they fight back. Ammunition. 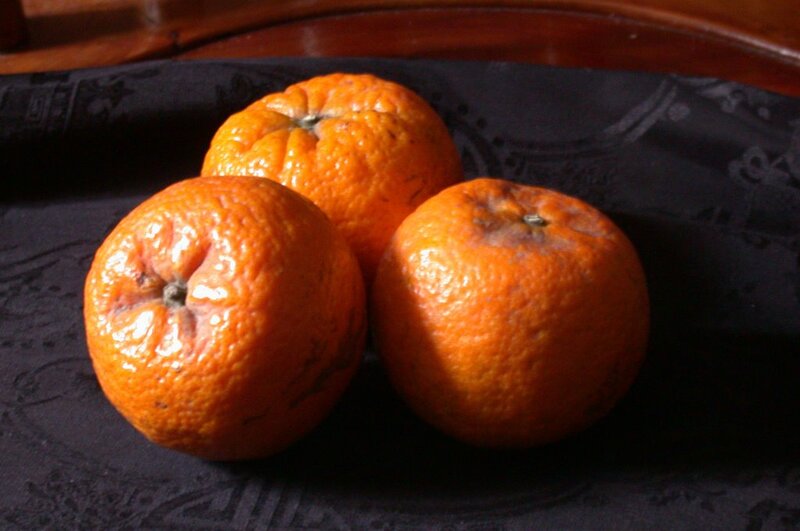 I still have a bunch of Mandarin oranges leftover from Chinese New Year. They’re a bit soft now though. I may need to go buy some fresh and therefore harder ones. I want to stun them, not wash them! Running shoes. In case they fight back and decided to go on a counter-attack. Shield. To deflect any apples hurled at me by half-blind, delusional and desperate blokes. You never know. If someone throws apples at me, they better run before I pitch them right back below waist level. Wet wipes. Blood may be shed. Tears certainly will be when I nab nothing but a concussion and a law suit. Camera. I want to blog this. How often does a girl get to pummel her love life into shape by thwapping her targets with oranges, thus bagging herself some men? Imagine my supreme disappointment when Cal told me that you throw the oranges into the river and not at your targets. Spoilsport! I like my idea a lot more. What’s with the wimpy idea of polluting the river with fruit that will rot in no time? OK, so the Singapore River is horribly polluted already but that’s besides the point! And what’s the fun of watching bobbing oranges and apples wash out into the ocean on the ink, black tides? I rather watch men bob in the river after falling into it from orange-induced concussion. I think Singapore should reconsider this traditional Chinese custom of getting your men. It could be like the famed tomato festival in Spain. Bag your men with your bag of oranges! Make OJ! It could become an international sensation. Single women from all over the world would convene in Singapore. Men with masochistic streaks could be flown in. The World Series can take a back seat. The New Orangelympicks has arrived! It would put Singapore on the international map. Instead of Singapore, the Clean and Green City, it can be known as Singapore, the Formerly Clean and now Orange City of Love! Despite my disappointment, I am still keen to take a few pot shots at the Singapore River with my arsenal of oranges. Not because I want to find my love match but simply because I want to see who attends these events. Your intrepid blogger will be cruising the River of Love to find out what drives people to commit citruscide. I may even interview some of these fruity people – it’s all very fascinating. Hopefully no one tries to throw me into the river. Watch this space for a possible water-logged report after Sunday. Sounds fun to me "I wish I'm still single so I could invite myself-lol!" Let me know what happen okay! Hey Tin, it sounds scary to me actually. But I am always game for a new experience ... I think. Will try to report on this if I do not back out at the last minute! Thanks! err excuse me madam what brought you to this event? Maybe it was my passive agrressive tendencies coming to the fore but I turned my ankle early this evening, thus preventing me from going to the Orangelympicks. To be honest, it's no real loss as I am in no hurry to be tagged but I am a little disappointed to have missed the fireworks and to be sporting a very unglam limp now. So sorry, ladies ... no blogging of orange tossers here.